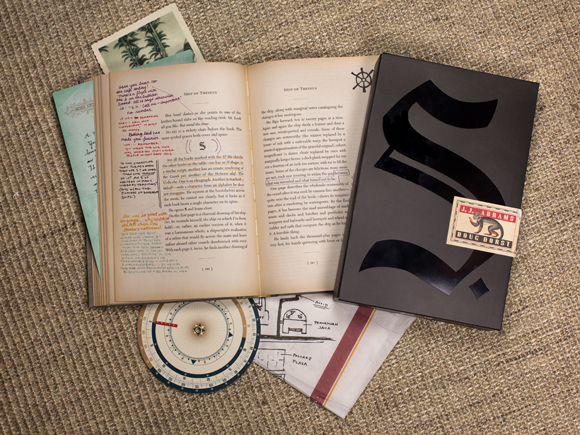 Reader’s Guide | Thoughts On "S"
This post is intended as a short, spoiler-free introduction to new readers of “S”, a book authored by Doug Dorst and conceived by J.J. Abrams. Seasoned readers – you probably already know everything here. If you have additional thoughts or resources to add, please let me know. “S” consists of the fictitious book, Ship of Theseus by the fictitious author V.M. Straka, along with is marginalia, inserts, and translator foreword and footnotes. Ship of Theseus is the 19th book by V.M. Straka. The other 18 books (fictional and non-existent as far as we know) are listed inside the book to the left of the title page in apparent chronological order. The book is filled with the margin notes of two people, a male and female, who first meet not personally, but by exchanging notes over a period of time. As you read the marginalia, pay attention to the colors of the ink/pencil used to write, underline, draw, etc. It could help you determine if one set of colors was written at a different time than a second set of colors. The inserts consist of handwritten notes, photographs, maps, postcards, newspaper clippings, etc., left by the same two people who are writing in the margins in order to communicate. It also includes something called an EOTVOS wheel which you will find in the very back. These are the work of F.X. Caldeira. The foreword introduces the translator’s self, the author V.M. Straka, and various other information about the book and the translator’s influence. This is up to you. I suggest you be careful to flip through the book and note the placement of the inserts first. If you don’t, though, there is a handy web page that will help you remember where they all go. The placement of the inserts is likely important to some degree. Some readers have chosen to read Ship of Theseus along with the marginalia, inserts, and footnotes as they come to them. This is one method. However, it may fragment your ability to comprehend what you are reading with too much multi-tasking. Also, the margin notes may not be in chronological order, so you risk even more confusion if you go front-to-back taking everything in at once. Another option is to read the printed text of Ship of Theseus in its entirety before going back through a second time and reading the margin notes and viewing the inserts. Understanding the book itself may help you understand extras and the story they contain. This may be difficult for some readers, because the printed text is often underlined, circled, or otherwise emphasized with relevant discussion in the notes. I urge you to dig. Give in to the unknown for a while and ponder the mystery. It’s worth it. What is this EOTVOS wheel thingy and what do I do with it? That becomes clear only in the margin notes, so don’t worry about it until you have digested those. Once I get going, what resources are there to help me along? Here is a list of recommended resources for understanding “S” that go beyond the physical, printed book. The iBook version. If you have an Apple device (Mac, iPad, iPhone), there is an electronic version of the book. The inserts are present and can be “handled” interactively. The EOTVOS wheel even works. This is helpful because everything but the marginalia and inserts is keyword searchable. You also have the wonderful ability to completely turn off the marginalia and inserts, leaving you with nothing but Ship of Theseus to read without distraction. The audio version of Ship of Theseus. This adds another layer to your ability to comprehend the text. The audio does not contain any information about the marginalia, inserts, or footnotes. It is purely Ship of Theseus. The SFiles22 blog. This blog does a good job of letting you explore the various aspects of the book. However, please be aware that you may find spoilers as you read what the blog author and others have discovered on their journey together. I suggest reading the book through completely, and then coming here if you do want help and don’t mind spoilers. I enjoy the community there and the mutual perplexity as we work through some of the puzzles. Several puzzles have been solved and are explained. This site also does a good job of referencing additional resources not mentioned here. This blog (Thoughts on “S”). This blog is by no means comprehensive. It is simply one reader’s approach to understanding the armature of “S” and the answers to its many magnificent puzzles. This growing list of additional “S” resources. Twitter. Explore twitter to see who is talking about “S” and follow those you think will help you. A great place to start would be @SFiles22 and @MyTheseus – two accounts that focus exclusively on “S”. I suggest you read the book first before following unless you don’t mind spoilers. I would also suggest following @DougDorst, the author of “S”. For example, he just posted something interesting on December 19th that serves as an additional, post-production insert to the book. It is worth studying. I have a feeling that more clues are coming from @DougDorst. There are also some twitter accounts that may or may not be apocryphal: @VMStraka, @EricHusch, @JenHeyward, @FXCaldeira. Anything else I should keep in mind while I read? I suggest simply absorbing the story as much as possible. As you do, connections will begin to form in your mind that seem to point you in various directions. For example (minor spoiler alert), there is a monkey that appears occasionally throughout the book. At one point, a character says, “Follow the monkey.” This seems to indicate that each time there is an appearance of the monkey, a clue may be present. The biggest bit of advice I can offer is simply to relish every part of the “S” experience. Take your time. Explore. Wander. Ponder. Meditate. And, if you so choose, join others in person or online in exploring the mystery of “S.” And if you have anything to add to this guide, please don’t hesitate to leave a comment and let everyone know.